If a child goes missing, one of the most important tools for law-enforcement authorities is a high-quality, current image of the child. The SmileSafeTM photo ID card provides exactly that. Through the information on the card, you can give authorities immediate access to your child’s most recent school photo. The SmileSafe program is offered in most schools that use Lifetouch as their photography partner. If you’d like this program in your school, please tell your school administrators. 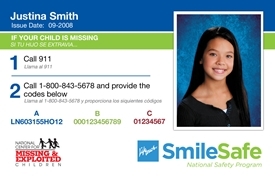 • Store a printed version of the SmileSafe card in a safe place. You may have received this printed card as part of your school portrait order. Keep it in a place where it won’t get lost and you can quickly access it. For this reason, you should not give the card to your child to keep. • Create a child ID kit. This gives authorities additional descriptive information about your child, such as height and weight, physical traits such as scars or birthmarks, and even fingerprint information. If you believe your child is missing, act immediately. 1. Call 911 or your local law-enforcement agency. Provide your child’s name, date of birth, height and weight, along with unique identifiers such as eyeglasses and braces. Tell them when you noticed your child was missing and what clothing he or she was wearing. 3. Lifetouch volunteers are available 24 hours a day, 7 days a week to rapidly respond to child portrait requests. The National Center for Missing & Exploited Children is a 501(c)(3) nonprofit that works in cooperation with the U.S. Department of Justice’s Office of Juvenile Justice and Delinquency Prevention. Since it was founded in 1984, it has assisted law enforcement in the recovery of more than 199,575 missing children. The National Center for Missing & Exploited Children is a 501(c)(3) nonprofit that works in cooperation with the U.S. Department of Justice’s Office of Juvenile Justice and Delinquency Prevention. Since it was founded in 1984, it has assisted law enforcement in the recovery of more than 196,488 missing children.